Does it seem to you we spend a heckova lot of time tending to the various electronics, appliances, communication devices, etc etc etc. Does to us. We've spent a great deal of time getting our system to handle the new fridge....actually we've decided it won't do so very gracefully in it's current state, so we'll be adding an additional panel and two more deep cycle batteries down the road. For the moment, we're connecting the thing to shore power while our finances recover a bit. There are a few things in this regard we've done that have made things easier. Using the DC power supply (a 12v plug in adapter for usb power chargers) has kept us from having to run the inverter constantly. 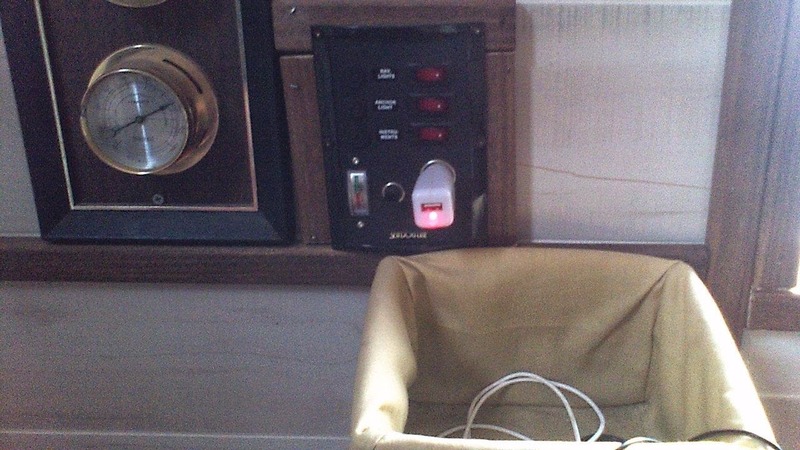 To facilitate things, we added a basket next to the 12 outlet (which is at our running lights panel). It's big enough to hold phones and tablets and all their associated wiring, and in general keep us from tripping over or dropping the things. It makes things simpler, which is, after all, the objective. We took a really pleasant trip yesterday down Middle River in our electric inflatable. I'll upload video a bit later today, so stay tuned.